The corrugated box industry in the south-west of England is thriving if the level of investment in new equipment is anything to go by. One of those companies investing is Smart Packaging, the Yate-based privately owned packaging supplier. As well as boxes, the company also supplies a diverse range of packaging materials, being a distributor of Jiffy, Flo-Pak, Cell-O and many other types of packaging products. But it is boxes that make up the bulk of the £5 million turnover, from standard stock boxes, right through to intricate die-cut, folded and glued cases. Serving a diverse range of businesses and industries within a 60 mile radius, Smart Packaging have tried to position themselves as general manufacturer of corrugated packaging solutions — from internet retailer packaging, to food transit outers, boxes for engine parts through to one-off production of boxes for domestic use. We first reported on Smart back in late 2010 following the installation of the first Bobst Vision flat bed die-cutter in the south-westof England. Some five years on, the company has grown again, so much so that they had to move to bigger premises. "It has been an interesting few years," recounts Martyn Olds, one of the owners. "When Trevor and I started up the business, we could only afford second hand machines. As business started to pick up, we decided to invest in new machinery, including the Bobst and a TCY printer slotter. Off the back of these investments, our business grew steadily, until last year when we realised that to move forward we had to get another converting line. Here was the problem - we didn't have enough space for a new line!" "We took this opportunity to look at moving into bigger premises," continues Trevor Walters, co-owner. "We didn't want to move miles from our existing location, so we started to look at what was available in the same industrial park. Two units became available next door to us, so we took on the leases and moved everything next door. We kept on one of the old units, which now acts as our storage area for our packaging products like the Jiffy, Flo-Pak and stock boxes." Trying to move factory and continue production is no mean feat. However, with the help of ID Machinery, Smart Packaging achieved a seamless move into the new, 42,000 sq ft facility on the outskirts of Bristol. " We were very lucky, as the units became available for us a little earlier than we had hoped, which meant we could get all the power lines, utilities and essentials installed," says Mr Olds. "We prepared the trenches for the waste handling system and prepared the entire factory ready for delivery of the first machine. We also opted to install a centralised waste extration system from Impact Air Systems, which automatically conveys the waste board and trim from the converting machines into an externally sited compactor. This will save us considerable amounts of man hours in terms of transporting waste, keeping the factory clear of waste, improving the working environment and reducing fire risk." Installed in May 2015, the first machine to go into the new factory was a 2.5m 5PA-FGT from TCY of Taiwan. Supplied and installed by TCY's UK agent, ID Machinery, the line is equipped with three flexo print units, is fully computer controlled and has the latest generation TCY chamber doctor blades. Bundles of finished boxes are strapped, in-line, on a Mosca bundle strapper, prior to palletising. At the same time as this line was installed, a materials handling system was installed behind the casemaker, leading the finished pallet loads onto the Mosca pallet strapper. The materials handling solution was designed and delivered by Interpack Machinery Services. "Our relationship with ID Machinery goes back a long way," explains Mr Walters. 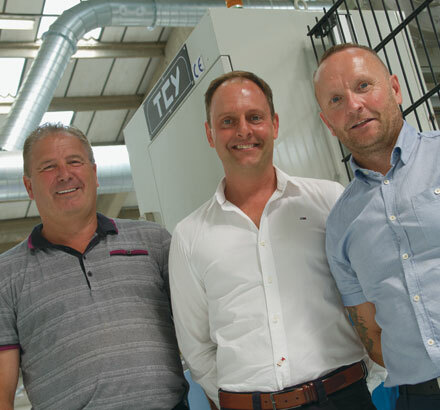 "We have bought quite a lot of kit off them over the years, including a new TCY 6PA printer slotter back in 2004 and a second hand Emba folder gluer. We also bought a couple of Godswill stitchers from them, one in 2010 and the second in 2012. When we decided to move, we had no hesitation in contacting them to undertake all the machine moves for us - they have done a fi rst class job for us and had us up and running on schedule." Now the company has settled into the expanded facilities, Smart Packaging is working smoothly. The converting hall was buzzing when we visited — the Gopfert SRE Maxi box-maker running next to the TCY 6PA, with the new 5PA-FGT running fl at out near by. The material fl ow is now logical and planning of the plant is controlled by an Abaca system. "The installation of the Abaca software suite was a real game-changer for us," recounts Mr Walters. "Prior to this, we ran the business on a series of Excel spreadsheets and lots of paper. Since the installation of the Abaca system a few years ago, we have totally changed the shape of the business. We cost estimate far more accurately, we can plan the jobs in hand easier and the reporting functionality has made our lives, as owners, a lot more simple. It was a great investment that has paid for itself many times over already," continues Mr Walters. "Now we are fully operational in the new factory, we are taking stock of what this means to us and to our customers," concludes Mr Olds. "With the improved layout of the equipment and investment in new machines, we have signifi cantly increased our production capacity. With this, we will further improve our already impressive JIT delivery to our customers, as well as expand the overall product offering. Thanks to the new TCY casemaker, we believe we are starting the next chapter of our business development and this is something we are most excited about.